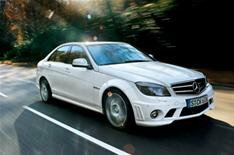 First drive: Mercedes C63 AMG | What Car? Turn the ignition in the C63 AMG and the engine emits a roar that frightens grannies, sends cats scurrying and makes birds take flight from the trees. The bad behaviour continues when you slip the gearbox into Drive, because the 451bhp V8 engine has power and punch right from the start. That power is managed through a super-slick, seven-speed gearbox which operates in three modes Comfort, Manual and Sport. Translate that to quick, quicker and quickest. Also coming in threes is the car's electronic stability control programme, which can be set to 'ESP on', 'ESP Sport' and 'ESP off' or 'Woo-hoo', 'Yee-ha' and 'Yikes!'. If there is a downside, it's that even the comfortable leather sport seats can't disguise the really hard ride of the C63, especially at low speeds. Mind you, running costs are as likely to make you wince as any pothole. Make the most of the V8 engine and you'll struggle to get anywhere near the official 21mpg figure you'll also pay plenty of visits to your local petrol station shell out a fistful of cash in tax. • The C63 AMG is on sale now for £51,425.